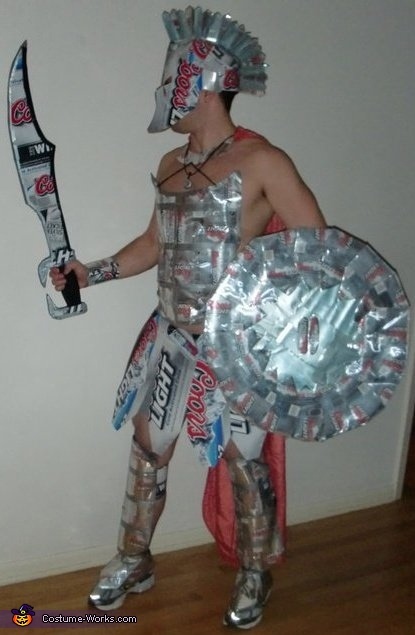 Coors Light Spartan Knight - Halloween Costume Made of Beer Cans! I am wearing this costume in both pictures. The idea came to me after I watched the movie 300. I was enjoying a mid-day beer (Coors Light is my favorite) sometime in mid-September of 2010. I decided I wanted to go as a Spartan Warrior for Halloween that year. My roommates, Tim and Kelen, jokingly said I should use our accumulated empty beer cans and cut them into a crude Spartan costume. I had so much time on my hands I figured why not! Well... to make a long story short I went "over board" and after much drinking and many hours later I made myself an awesome costume! I couldn't dig up any images take while I was making the costume but here is a step-by-step process. I used a total of 6 empty 24-pack Coors Light cardboard boxes, approximately 55 empty Coors Light cans, 1 roll of duct tape, a piece of plywood cut into a shield, 2 leather straps to hold the shield, a red cape taken from my mom's hair salon and lots of glue from a hot glue gun! I literally started from scratch. First I made the kilt by cutting out sections of the card board boxes and reinforcing them with duct tape. They are held together by a thin belt which is looped through the reinforced parts. Next I worked on the vest. I outlined a template that fit me then cut beer cans to shape. I used duct tape to wrap around the sharp edges then clear tape to secure everything together. I then attached the cap tot he vest via a neck piece made out of a cut beer can and some leather straps. That necklace I am wearing is a Coors Light bottle cap. The sword was easy. I drew out a template and cut about 9 layers of Coors Light box cardboard and layered them on top of each other until the thickness was right. These were then secured with duct tape and black electrical tape. Next came the wrist, shoe and shin guards. Both of these are made from cut up beer cans. Next I worked on the shield. I bought a square piece of plywood and cut it into a circle. I sanded down the sharp edges then began stapling cans in a scaled pattern along the outside of the shield. I then turned some of the cut cans inside out and laid them in the center (blue) and pulled the edges of the shield rim cans over the center. All of this was then secured with clear package tape. The hardest part by far was the helmet. First I took a measuring tape and measured my head. Then I began piecing together the skeletal structure of the helmet with pieces of box card board. once I had the skeletal structure created I hot glued larger pieces of Coors Light box to make a skull-cap. Once the skull cap was complete I outlined and cut out the template for the face mask part then glued it to the skull cap. The fins were tough... I had to cut up beer cans, bend the bottom of the cutouts and glue them to the skull cap. I then further secured the fins with layers of cardboard glued over the folded base flaps. Looking back, it was WAY too much work for a costume. But I had fun making it and enjoyed wearing it out around Chicago over Halloween weekend. One bartender even offered to pay me $100 and give me an open tab for the night if I agreed to come back to his bar the following day and root for Michigan State (it was a Spartans bar)! Nicely done. Great handy work. 5 stars. Thanks for the 5 stars, B! Great Costume! 5 stars for you Nick. Does anybody sell these? Cool idea but do not have the time to make it. I'm in the process of making the same costume but out of Natty Light cans! And you are sooooo right, the helmet is very tedious work. It is almost complete and I'm looking forward to wearing mine around downtown Boone NC. Thanks for the idea. Definitely use a hot glue gun. Tape is just going to be uncomfortable and flimsy.